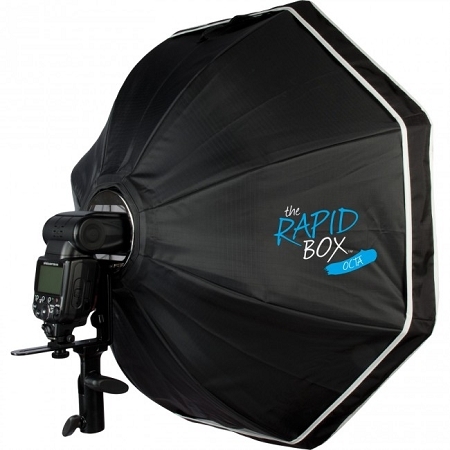 The Westcott Rapid Box - 26" Octa Softbox lives up to its name by providing a soft quality of light for your shoe-mount flash that sets up and breaks down in a fraction of the time as most competitors. The box comes complete with a tilting 5/8" receiver stand mount/shoe mount/speed ring combo that disengages quickly from the box allowing it to close like an umbrella. The 1.0 stop diffusion front face is removable revealing a highly reflective, high-output silver interior.